Particle means protection, but it comes with a bonus. The first of its kind, for many reasons. While remaining lightweight and agile, the particle iPad case protects your iPad where it needs it most - at the edges. Integrated rubber feet provide traction and stability for tabletop use, while the stylus clip keeps the included Pogo Sketch close at hand. Your iPhone® 4 has become a big part of your life. With FaceTime video, retina display, multitasking, HD video recording and more–you've got a lot to lose. You won't find a tougher case than the OtterBox Defender Series for iPhone 4. Relax, we've got the iPhone 4 covered. The Barely There is Case-mate's new line of sporty Samsung Galaxy S cases. These cases are designed to protect the design of the Samsung Galaxy S (T-Mobile Vibrant) while allowing more of it to show. "Honu" is Hawaiian for "Sea Turtle". See the resemblance? Honu's double layered design features a dense, two-tone outer layer on top of a thin inner layer for up to three colors! Honu's double layered iPhone cases design grants you increased customization over your iPhone 3G or 3GS. Swap out the inner silicone core to create your own color combinations. honu™ comes packed with the Incipio® Vanity Kit, complete with a surface protector, an applicator card, and cleaning cloth. Use the video stand for horizontal hands-free viewing. Your media on the go – your way! The Sansa® Fuze™+ MP3 player gives you more player for less money. From its sleek and thin styling to its invisible touch control, the Sansa Fuze+ MP3 player delivers a great user experience and lets you do more than just play music files. Add a blank microSD™ card to expand your own music library or an optional slotRadio™ card for an instant library of songs - even listen to FM radio with the ability to record stations or record your voice with the built-in mic. Sansa Fuze+ MP3 player is the newest in a long line of award-winning players from the inventor of flash memory. BodyGuardz is the perfect Samsung Galaxy Tab screen protectors. It provides scratch protection from outside elements without the need of bulky cases. BodyGuardz is designed to custom fit the Samsung Galaxy Tab. These invisible protectors are made from the same material that is used to shield the front of automobiles from stones and other abrasive elements. Tough and durable, BodyGuardz for the Samsung Galaxy Tab will keep your device protected from scratches. BodyGuardz is easy to apply and is designed to offer full body and/or screen protection to your device while letting the beauty and design of the Samsung Galaxy Tab shine through. BodyGuardz is optically clear and remains invisible without distorting the dimension or design of your Samsung Galaxy Tab. If you're looking for Samsung Galaxy Tab cases, screen protectors, covers, shields or skins, you just found it with BodyGuardz. The built-in stand will come in handy while trying to watch a movie or video, and creates a comfortable browsing experience. When using your iPad on a flat surface, the silicone grip pads on the bottom will hold your device securely in place. 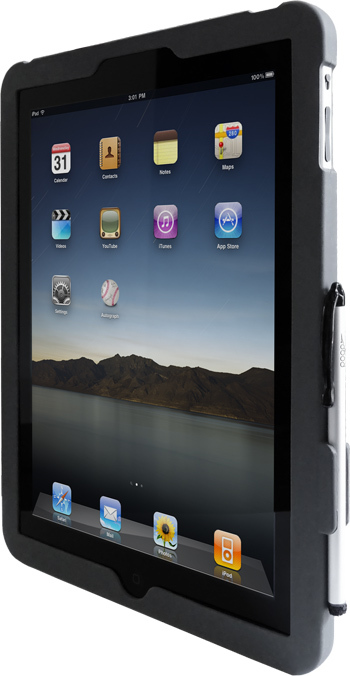 We also designed this case to accommodate the optional iPad dock accessory! Take your iPad everywhere you go knowing that it is safe from the occasional drop, bump and/or scratch. This super-slim case snaps around your iPhone to provide protection from scratches, dust, and boringness, adding less than 1mm of thickness to your iPhone without blocking the dock connector, controls, or headphone jack. But don’t dilly-dally. Like the shirt designs they share, we’re building these cases in limited quantities. With this much awesomeness crammed into one thin case, we expect them to sell out quickly. When they’re gone, they’re gone. So hop to it. Click. Buy. Be happy. It feels really good, this case does. And it looks good, too. Sleek, stylish, a hint of sophistication and smarts; this hard-shell case with matte soft-touch coating becomes even more impressive if you match the fabric-wrapped back to your outfit, scarf, or tie. Place your iPad into the back half of the case, making sure you have it set the right way (check the headphone plug and 30-pin connector for alignment with the cutouts). Place the front of the case on top, again, checking for alignment to make sure you have it the right way. Start at one corner, and snap the two pieces together, going all the way around the edges till the two pieces are firmly seated together on all sides. To remove the Fitted iPad case, start at the button cutout on the side, and gently pull the top half away from the bottom half. Working your way around to the corners, un-snap all the way around until the two pieces are completely separated. A wild and raised jungle design is featured with the Tribal - one of several case designs out of the Incipio LAB. The raised tribal look offers added grip as well as killer looks. Offered in six distinct and exotic colors, the Tribal's design and color combination will add that extra bit of flare to any outfit. The wild colors and embedded jungle design are sure to grab attention. The Tribal comes packed with the Incipio Vanity Kit, complete with a surface protector, applicator card, and cleaning cloth to ensure that your iPhone 3G or 3GS stays in prime condition.